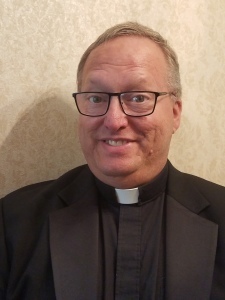 Staff Member: Father Benton Clift, Sr. I wanted to share a little about myself as a means of stimulating conversation and helping to get to know one another. This is written in a bit of haste as many things as you might imagine are going on right now. This biography might help explain things and perhaps answer some questions that might be on your mind. Saint Philip is my home parish since birth. I have watched with amazement how my children had grown from little miracles into the fine young people they are now. My oldest son, Benton, Jr. and his wife Megan, four years ago, blessed our existence with the third of my three grandchildren. My daughter Elizabeth is engaged and will be married in May. Five years ago, I watched my youngest son, Brian, head off to his enlistment duties with the US Air Force. These things have all occurred after some dark events in our lives. With support from family and friends and most importantly the Holy Spirit, my children and I were able to provide a good Christian home for ourselves. My wife Donna and I divorced in 1997 and a happy and productive life for us was anything but guaranteed. There were so many ways things could have turned bad. In retrospect, it is easy to see the slow, methodical guidance of the Holy Spirit shepherding our family into the life we have now. The tragic loss of my then ex-wife Donna in 2008 and my mother’s death from Alzheimer’s disease three years later was a very dark time. However, those bleak times served as a catalyst for change and conversion. God is always making two calls to us; one is a call to Beatitude and the other is to serve the Kingdom. In the call to Holiness, we are called to seek the face of God, to love him with all our heart, mind, soul and strength so that we can live a fulfilled existence in this life and into the next. In service, we are called to work in the vineyard and in the fields sowing and reaping for the good of the Master who in turn gives us all we need. These are vocations; some are vocations to family life, as mothers and fathers living and loving as reflected in the Holy Trinity, producing good fruits for the harvest of souls into holiness. This is the priestly call to all Christians. Some are called to vocations of ministry in the Church, to be the hands, the voices and most of all to be the heart of Jesus and bring it all through the Gospel to all we encounter. That is the calling of the priesthood, the diaconate or the consecrated religious life of the Church. On April 13, 2013, I and eight other men from our Diocese were ordained to the permanent diaconate. Personal circumstances changed for me and impediments were cleared. I was able to continue my studies and formation to serve in the priestly order of the Sacrament of Holy Orders. I was ordained to the priesthood, May 19th, 2018. I had to finish some degree work at Saint Vincent and I traveled back to Blessed Sacrament to celebrate the weekend Masses. I have just finished my Master of Divinity Degree at Saint Vincent Seminary. I am not slowing down at all. Last Thursday, I was notified of my change from parochial vicar at Blessed Sacrament Parish to parochial administrator here at Saint Anthony. I look forward to getting to know this parish, the parishioners and the greater Taylor Mill community.